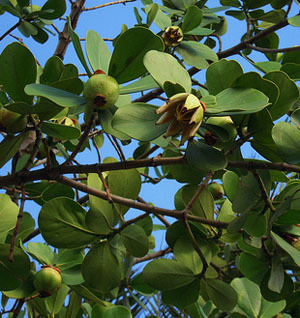 Autograph Tree, 'Clusia rosea' also known as Pitch Apple, Balsam Apple, Scotch Attorney, Copey, Wild Mammee, or Balsam Fig is an evergreen tree well known in most tropical areas. It originally came from the West Indies. It can grow to 50 or 60 feet high with a 24" diameter trunk. The large white fragrant flowers are showy and occur in summer. They sometimes have tinges of pink. This tree has a dark side, much like ficus, where it can take root in the fork of another tree, then it sends down aerial roots as it proceeds to slowly strangle the host tree. It is very tolerant of many habitats including sun or shade, various soils and is resistant to wind, drought and salt. The common name comes from the long lived leaves that can be scratch written on. This tree has no particular pests, other than humans who add graffiti to the leaves.